Money Money Money Money Money. . . 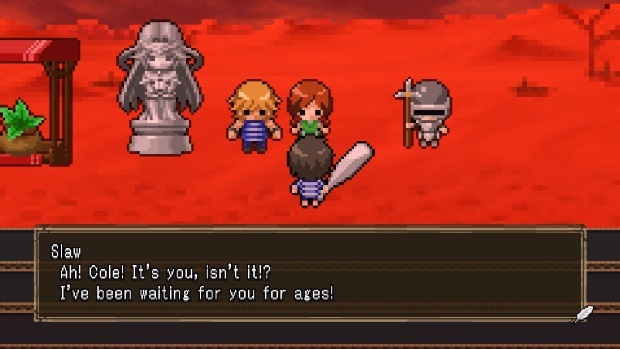 Marvelous, publisher of such fantastic titles as the Harvest Moon and Rune Factory series, plus Fate/Extra and Skullgirls, offers us the sequel we did not know we were waiting for: Half-Minute Hero: The Second Coming! The premise of the game is that every major bad guy can destroy the land that you are in, but it takes thirty seconds to do so! Enter the Time Goddess. For a price, the Time Goddess will turn time back so that you can continue forward. At first this game might seem infuriating, with good reason. 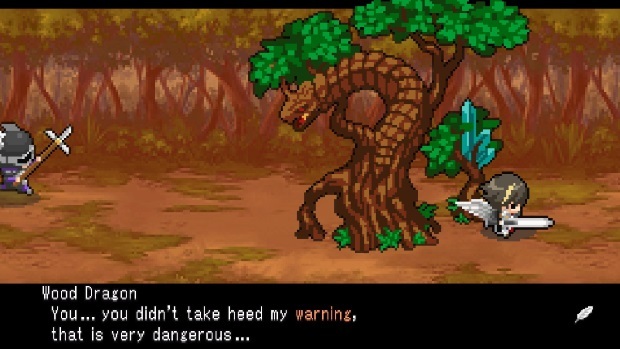 However, the game is charming and clever, offering lots of throwbacks to the days of more pixelated RPGs. As the hero you must find like-minded individuals, collect ridiculous (and awesome!) pieces of equipment and fight the clock while fighting the forces of evil. I admit to a bit of trepidation before I began playing this. I remembered seeing the original, and since I heard that you had to complete each stage in thirty seconds, I thought it sounded like a terrible idea and tossed it aside. This turned out to be a foolish decision on my part! I did not realize how intricate and funny the title would be. Not to mention that on Steam, now and forever, if you purchase Half-Minute Hero 2: The Second Coming, you get the soundtrack and the original game, a deal that started just this past week. It is a part of their “Late-Access” to Half-Minute Hero 2 which I thought was quite clever. The game is a challenge, and despite constantly redoing quests to succeed, I had fun from start to finish. From the ridiculous names and humorous dialogue, this was a real treat. In Half-Minute Hero 2 there are a couple of game modes that offer a surprisingly large amount of content to sink your time into. 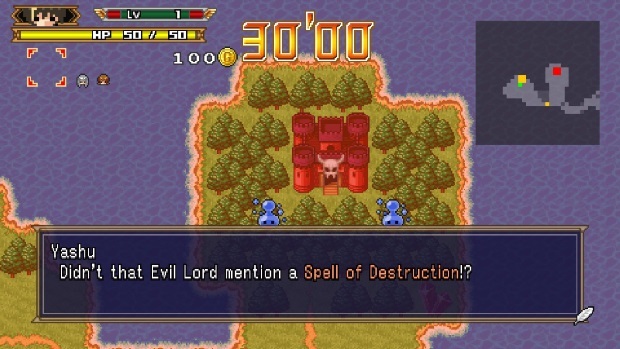 The primary mode of the game is the Story, which is separated into several episodes. As the game progresses, it introduces more game mechanics to challenge the user, while also giving them more tools to solve the puzzles/quests. Each of these episodes takes place significantly after the others (without spoiling the story too much!) and each of these heroes must balance money, time, and violence to progress to the next chapter of the story. 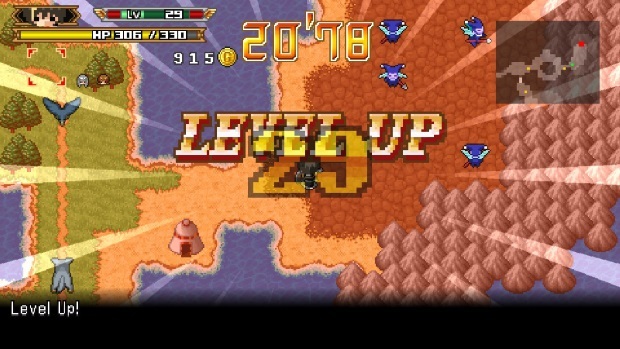 This is a level-based game, in that your character levels up as time goes on. But the leveling process is incredibly slow when not in a quest (quests have the thirty second rule in effect at all times). So how can one possibly proceed through the battles effectively? The Time-Goddess essentially lets you power-level, gaining exp at an incredibly heightened rate while in a quest. When not in a quest, you can level up as well, but at a much slower pace; luckily you start a quest at whatever level you were beforehand. Bear in mind as soon as the quest or mission is over, you reset to where you were at the start! While on the main map you can hold a button to dash as well. But do not get used to this: while in a quest dashing lowers your current hp at a steady rate. As you progress through the game you might notice that you are missing chests, items, characters and titles. The Goddess will eventually let you travel back to these missions to go back for the sake of completion. There is a lot to see and do in the story, and completing all of the episodes can take quite a bit of time. There is more to do though than simply saving the day alone. Edit Mode exists to create your own maps and challenges, and upload them to the Steam Workshop. You can also download someone else’s to test your skills. There are a few base maps, and you can change many of their facets to make them as easy or hard as you would like. Let’s face it; sometimes it is just nice to punish other people after banging your head against a quest. Another interesting option is the “Goddess Room.”The Goddess Room offers you an opportunity to spend the gold you gave up at the end of quests to customize your in-game experience. New outfits, skins for your menus, and other things await you. A time-sink, sure, but there is already so much to do in game that it will not be time wasted. There is more to do here than just build zones though! Waiting to test your skill is “Time Attack,” which as its name implies, challenges you to race the clock to best a mission as fast as possible. Infinite Battle pits you against a never-ending wave of Evil Lords, which must be completed in thirty seconds. These modes are fun and entertaining but there is one more mode of great importance that must be mentioned.. Multiplayer! Why not hate your friends in an all-new way? In Multiplayer, you can co-op, tag team, or simply free-for-all, racing to complete a map before anyone else. You can also change the settings, such as turning off “Breath of Destruction” (the boss’ monsters thirty second game-ender), among other settings. Thirty Seconds Or It’s Free: 4/5 Great. I truly feel that Half-Minute Hero 2 is a sleeper hit, one that has something for just about everyone. 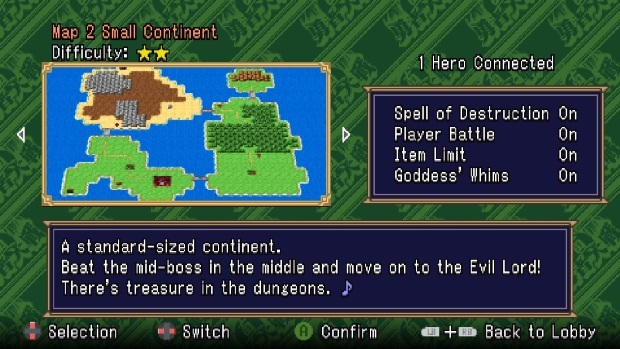 Dramatic, upbeat music, clever references to other classic RPGs, strategy, challenge, and replay value. Just because you complete a quest in one fashion does not mean there are not tons of other ways to try and succeed. If your friends are playing, there are a limitless amount of edit map/multiplayer options going on here. Half-Minute Hero is exciting and intriguing, and although its retro graphics style might not be for everyone, it is a clever lampoon at the gaming industry. Too often we as gamers look at graphics first, and if it doesn’t look pretty enough we toss it aside. Half-Minute Hero has a very simple look but there is certainly more than meets the eye. 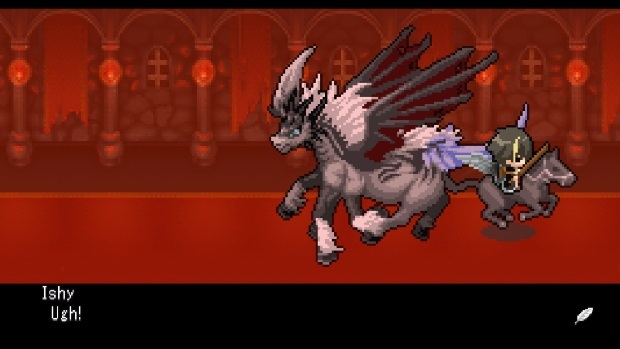 The sprite-styled graphics are beautiful, and the enemy boss art is just fantastic. It may not appeal to everyone, but to the player who occasionally misses this simplistic art style, it will be a fond trip down memory lane, while playing something current. The colors are bright and easy to see, and there are lots of little details to observe such as item changes on the main character. When the controls were working, they were crisp and fluid. However, Half-Minute Hero 2 did not appear to be too friendly towards the Playstation 4 controller (which is what I use on most titles). Even with a DS4 tool, a program that allows a PS4 controller to emulate an Xbox 360 controller for the sake of usability, it was almost impossible to use at times. The keyboard controls however are very sharp and reliant. Plenty of things to do in this game! The story mode is pleasant, and takes a fair amount of time to complete. The controls are not terribly complex and the ability to fast-forward through dialogue/cutscenes is terribly useful. Especially when you have played a map seven, eight, nine times. The music in this game is remarkable. There are quite a few composers working on this game and they all bring something fantastic to hear to the game. The main title music is suitably heroic and fast-paced, getting the blood pumping and the body ready to experience fastpaced adventure! 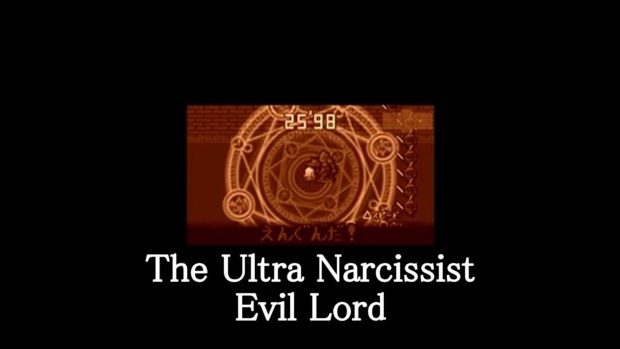 And that’s just what the game is; the music and sound effects neatly bring this title together. Prifddinas, the high-level content capital of RuneScape -- Jagex's flagship MMO -- has finally opened its doors to players. My.com have announced that Armored Warfare Early Access Test 5 will be launching on September 3 and will last till September 20. Bigpoint has announced new updates for its sci-fi MMO, Battlestar Galactica Online.